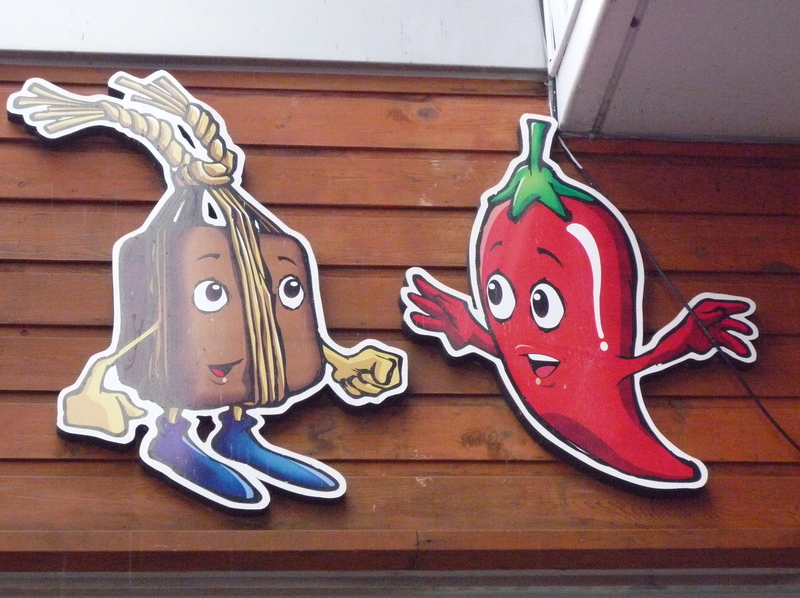 What did the chile pepper say to the fermented block of soybean paste? Okay, that was really bad. I apologize. But I didn’t come up with the anthropomorphized cartoon figures. 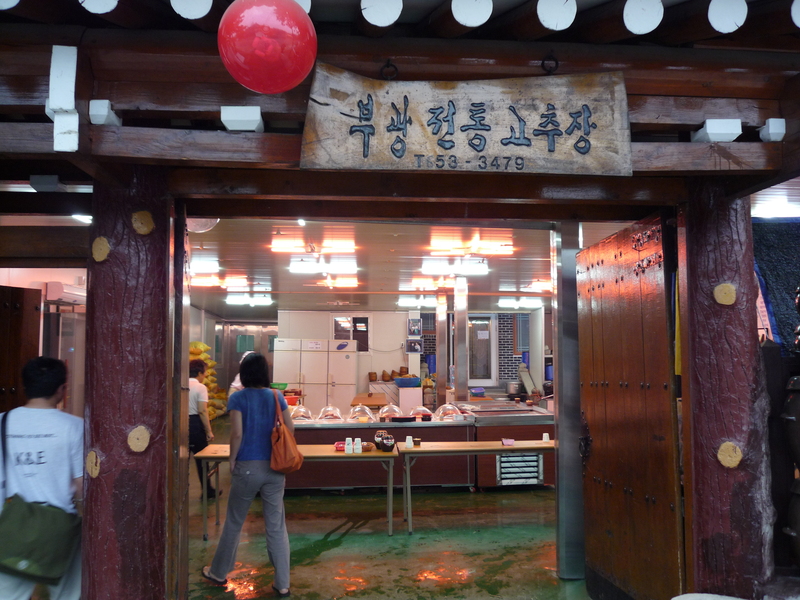 The Gochujang Village of Sunchang did. All this talk of gochujang brought back memories of our very quick, drop-by visit of Sunchang last fall. Sunchang is a small town in North Jeolla Province and the home of the Gochujang Village, a fairly new development that seeks to capitalize on Sunchang’s historical reputation for some of the best gochujang in Korea. Although it’s often used as part of a brand name, as in Chung Jung Won’s Sunchang Gochujang, it’s really a geographical marker. Chung Jung Won’s Sunchang Gochujang may very well come from Sunchang, but not all Sunchang gochujang is Chung Jung Won Sunchang Gochujang. We arrived too late to visit the Institute of Sunchang Fermented Soybean Products, where you can take classes on how to make gochujang. 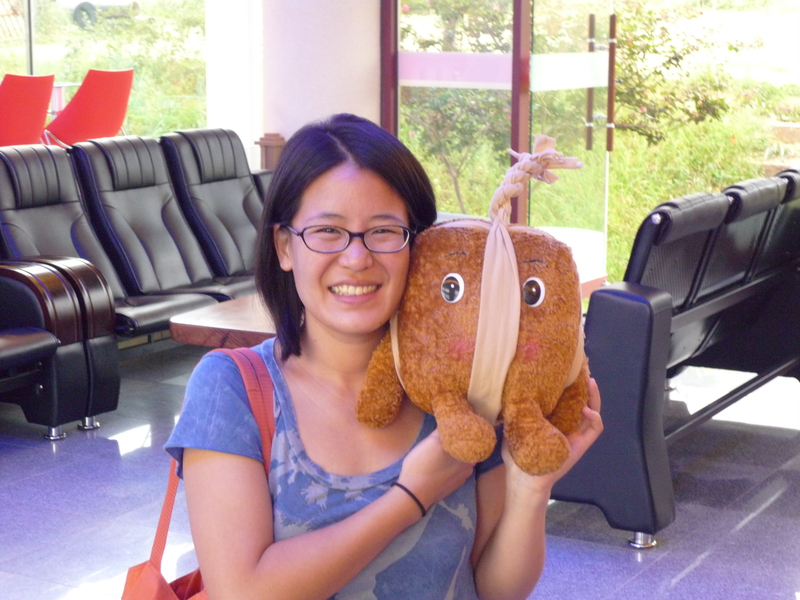 But we did walk around the lobby and I bought my favorite stuffed “animal” ever, here shown as Carolyn’s friend. It’s a meju block, made of soybeans that have been boiled and then packed into a block to dry, age, and ferment. If you look closely, you’ll see that Meju has pink cheeks — she is wearing blush! Afterwards, we walked through the “village,” which was comprised mainly of one or two streets of hanok or traditional houses with curving tiled roofs. 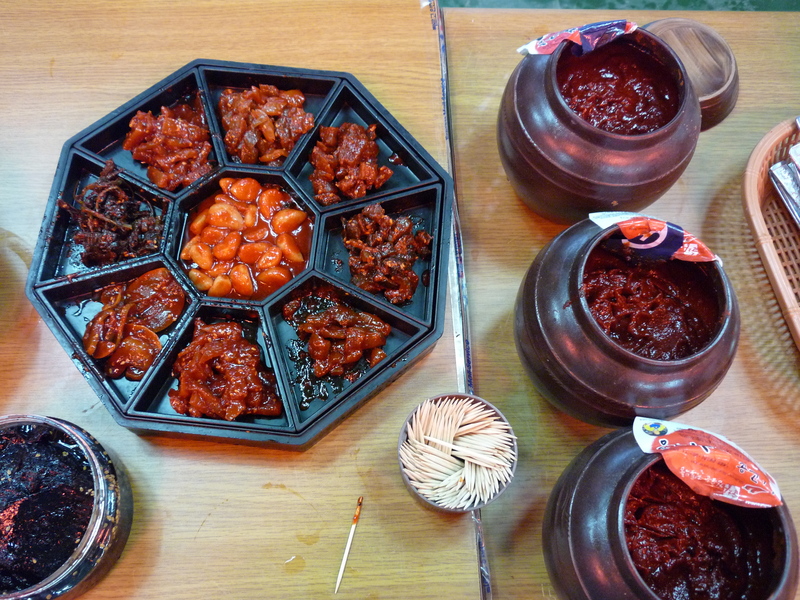 Each house sold gochujang, as well as other pickled products made with gochujang. They all bragged that they made 전통고추장, jeontong gochujang, meaning in the traditional way. They all called out for us to come in and try their products. They all looked alike, so we just picked one and barged in. They above are different types of jangajji, or vegetables and fruit that have been pickled with jang, which can mean ganjang/soy sauce or gochujang/red pepper paste. I wish I remembered what they are. We tasted each and every one, our tongues burning so that by the end, we could barely distinguish one from the other: garlic, plums, persimmons, pumpkin, and chi or wild aster. I loved a gochujang made with maesil plums, also known as ume in Japan. It was very sweet, but it had an interesting astringency that made it noticeably different from any other gochujang I’d ever had. When we got home, I asked my mom what made Sunchang so famous for its gochujang. She said that the area gets great sunlight, which makes for great chile peppers. I have no idea how it’s possible for one area to get better sunlight than another just a few miles over, but its gochujang was sufficiently prized that the area’s tribute to the king was always in the form of gochujang. I wonder, as the Korean government works steadfastly on trying to elevate Korean food internationally, why don’t they work on regional designations? France and Spain have standards for wines, jamon iberico, and other famous food products — Korea could set standards for Sunchang gochujang, Chejudo pork, Bongpyeong buckwheat noodles. Anyway, the modern explanation for what makes Sunchang gochujang great? Watch the ad for Chung Jung Won’s Sunchang gochujang below. Voice off camera: Hey grandma, how do you make gochujang? Grandma: You put in rice, barley malt, red pepper powder, you just shove it all in! Growl! V: Do you put in rice? G: Of course, you put in rice! V: But I heard people put in flour. G: What!?! (Brandishing spoon.) After red pepper powder, the next most important ingredient is rice. Put flour in that?!?! Go away! Hence, buy this brand of gochujang that promises to be made with rice! This isn’t a real blog post. I’ve been working on one, but have somehow gotten stuck. I’m hoping to get unstuck, but my excuse is that I’ve been making a lot of kimchi and jangajji (deeply salty Korean pickles). I have too much in my refrigerator, not all of it is good, and I need to deal with it. Back row: Green chile peppers in brine, waiting to be pickled in soy sauce; cucumber kimchi; pickled garlic; kkakdugi or radish; and green cabbage kimchi. Front row: Pickled perilla leaves; oiji or pickled cucumbers; and dongchimi, or water kimchi, which was absolutely abysmal. It’s been a frustrating couple of months, pickle-wise. There are some kimchis that I’ve made that I’ve felt really good about, but they’re the easy ones, cucumber and radish, spicy and tart at the same time. I like my kkaenip-jangajji or pickled perilla leaves also. I’ve been experimenting with fish sauce and anchovy stock, in addition to soy sauce, sugar, and vinegar, and I really like where I’m going. But baechu-kimchi, the classic Napa cabbage that everyone knows and loves, has vexed me. I’ve had friends eat and enjoy batches I’ve made, but it hasn’t once tasted quite right to me, or at least not through the whole process. I made a batch recently that my sister really liked. It was more lightly salted and fresher than most, the way my mom makes it, which I’ve recently found is a Seoul tendency. But it ripened into something really blah. I’ve made others where it tasted boring at first and then over time, became something sort of darkly interesting. It’s only recently that people have started writing down recipes for kimchi, of course, the kind of recipes that try to quantify how much salt, how much fish sauce, how many spoonfuls of pickled shrimp. The most important ingredient is salt, and as a chef told me recently, salt is the only seasoning that brings out the natural flavors of the underlying ingredient more sharply. So even if your kimchi seems to be smothered in garlic, ginger, and crushed red pepper, what makes it good is the quality of the underlying vegetable and your skill in drawing out that flavor through salt. You have to know your cabbage well. You have to know that winter cabbage is sweeter than summer cabbage, that cabbages from certain mountains are crisper than cabbages from elsewhere, and then, almost intuitively, adjust your salt accordingly. Ultimately, I don’t think you can learn to make kimchi from a recipe, no matter what Bobby Flay tells you. (He uses vinegar and vegetable oil! Read Maangchi‘s full take-down here.) You can certainly follow a recipe and end up with good kimchi. I’m going to include kimchi recipes in the cookbook, and you better believe I will stand behind them. But to learn and to know how to make kimchi takes time and practice. It takes a certain willingness to let go and be intuitive, to be humble and flexible. Being an A student who always follows the directions exactly isn’t going to make it happen, a lesson I have learned from experience. The last thing I want to do is discourage anyone from making kimchi. It really isn’t hard, fermentation anyway. 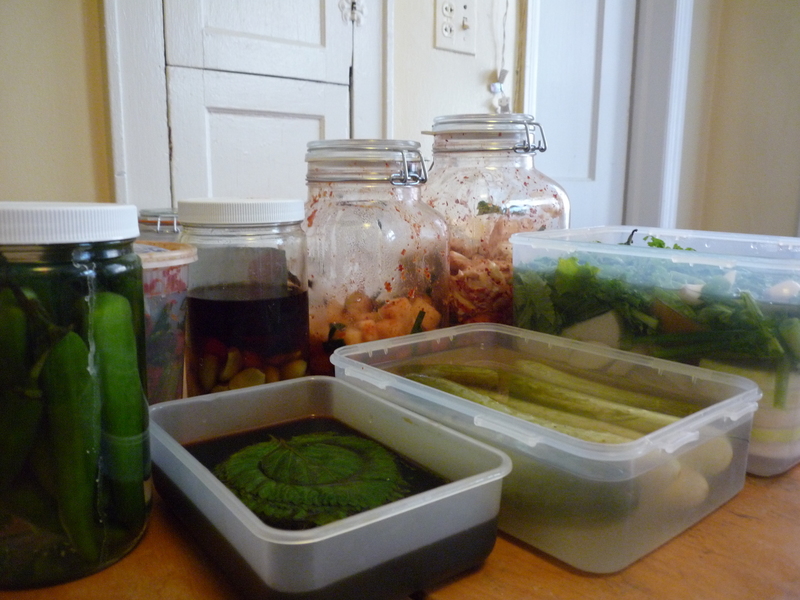 In fact, I think what I am trying to say is the more you make kimchi, the more rewarding it will be. “Korean parents hate to even think about a boy becoming a chef or working in a kitchen,” says his father, Soo Myung Choi, 59. “We wanted him to become a medical doctor, lawyer or government official.” Finally reckoning it would never happen, the elder Mr. Choi asked his son what the Harvard of culinary arts was, and suggested he attend.